WWE 2K on PC: Wrestling Modder's Dream? WWE 2K on PC: Wrestling Modder’s Dream? However, with the arrival of WWE 2K15 on PC this past Tuesday afternoon, the biggest question centered not on improvements, but on the potential for modding. For those unaware, 2K Sports NBA 2K has been receiving user mods for years, from scoreboard mods, to presentation mods, as well as tools to replace the music soundtrack and start screen splash image. PC modding isn’t new, but since the last wrestling game on PC was WWE Raw in 2002, which received some undoubtedly sh*tty mods, wrestling gamers had to rely on jailbreaking their PS3s and jtagging Xbox 360s to receive some of the deepest mods for WWE video games, such as Titantron updates and music changes. But the question remains: does it all change with WWE 2K on PC? The sheer potential for updating a WWE game with new textures for characters, updating titantrons for talent, as well as getting to completely come up with a new game (Memphis Championship Wrestling, anyone?) isn’t beyond reach, considering 2K and Visual Concepts’ open approach to modding. 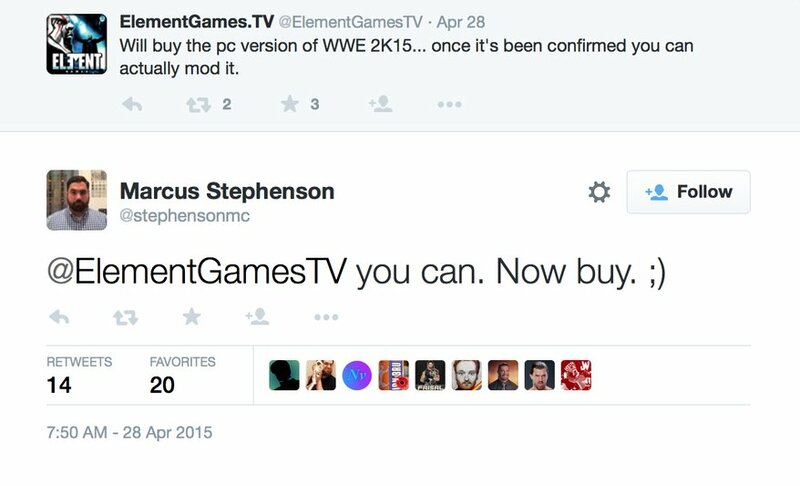 WWE Games’ Marcus Stephenson confirms WWE 2K modding. Hell, even this cheesy a** Spiderman entrance is hilarious, yet awesome. And I gotta represent the John Cena haters, because without them, John Cena wouldn’t have his trusty fiddle to play the crowd with. So sing along with me: JOHN CENA SUUUUUUCKS! As the months go by, we’re sure to see some more fleshed out mods and better modding tools for WWE 2K15 and beyond, but for now, I’d have to say that the future is pretty bright for wrestling fans and gamers, as long as modding is allowed to continue.